The White 7 Color Dual Needle Air Suspension Gauge features two needles to allow you to closely monitor your vehicle’s changing suspension conditions. 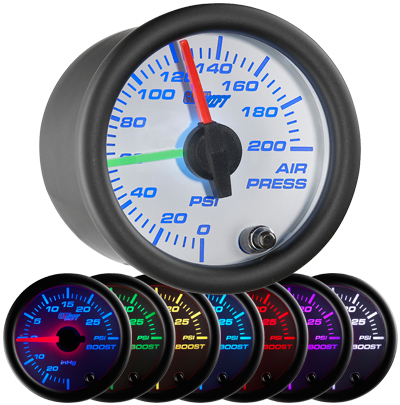 Since it directly affects the way your vehicle rides, monitoring and adjusting your suspension’s air pressure is extremely important, and this dual air pressure gauge will let you know when to add more pressure for road imperfections or when to release pressure for a custom lowered look. Easy to read red and green illuminated needles, stepper motor technology that allows for precise readings and smooth needle movement, as well as GlowShift’s 7 color through dial lighting and a magnified lens, are features of this dual needle air suspension gauge . GlowShift’s 7 Color through dial lighting lets you select from 7 different solid colors, along with 2 color cycle modes, that allow you to match your factory dash lights or add a custom look to the interior of your vehicle. With the color memory recall feature you won’t have to reset the gauge to your desired color every time you turn your vehicle on, and connecting this gauge to your factory headlight switch allows it to dim up to 30% for easier night driving. 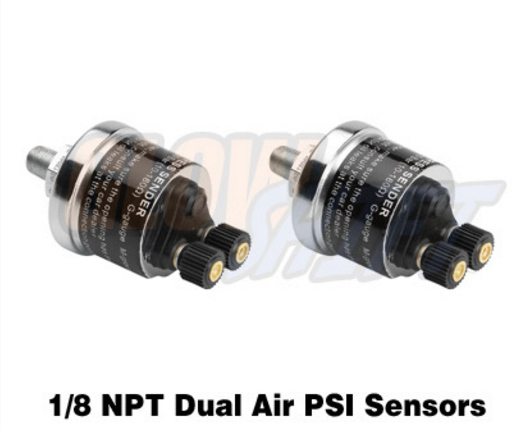 Included in GlowShift’s dual needle air gauge are two 1/8th NPT electronic air pressure sensors that work completely independently of each other, and will display your air pressure from 0-200 PSI. GlowShift has eliminated the need to run an air hose directly to the back of the gauge by utilizing electronic sensors, cutting down on your installation time. GlowShift stands behind all of its products. With every gauge purchase, GlowShift includes a one year limited warranty and free lifetime technical support . This Dual Pressure Air Suspension Gauge is Only $99.99 from us with FREE SHIPPING!